Enjoy the flavours of a true Honey BBQ Chicken without the worry of cleaning. 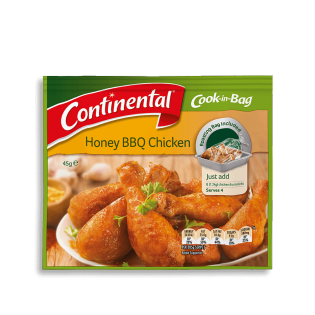 Continental's Cook in Bag is easy to use & serves 6 people. Learn more. Dextrose, sugar, flavours (contains wheat derivatives), thickener(1422), salt, spices (mustard, ginger, paprika, cayenne pepper, chilli) , garlic (1%), vegetable gum (xanthan), colours (carotene, turmeric, caramel lV, carmine), sunflower oil, food acid (citric), maltodextrin. Allergens:Contains wheat products. Made on same equipment that also processes products containing milk, soybean, peanuts, sesame, egg, fish and crustacea. Step 1. MAKE IT: Preheat oven to 180'C. Place chicken drumsticks into roasting bag. Step 2. SHAKE IT: Add Recipe Base and close bag using included tie. Gently rotate bag to coat evenly. Step 3. BAKE IT: Place on oven tray, in a single layer. Pierce top of bag 4-5 times with a skewer to vent. Cook on centre rack of oven for 40-45 minutes or until cooked through. Remove from oven, rest in bag for 10 minutes before serving. Hours of flavour in less than an hour – yes please! This smoky pulled chicken is so easy to make, with just 4 ingredients, and tastes amazing.